While a planned trip to Anza-Borrego State Park was a last minute bust, and the trip to Anacapa was a (not complete) disaster, I did manage do one shoot of California wildflowers while they were near their peak. The morning after the failed Anacapa trip fellow photographers Robert Mance, Dwight Blemker and myself headed up to the Tejon Pass to shoot some wildflowers. The weather seemed less than ideal as we set out early in the morning, but the weather would turn out to be magnificent for shooting. 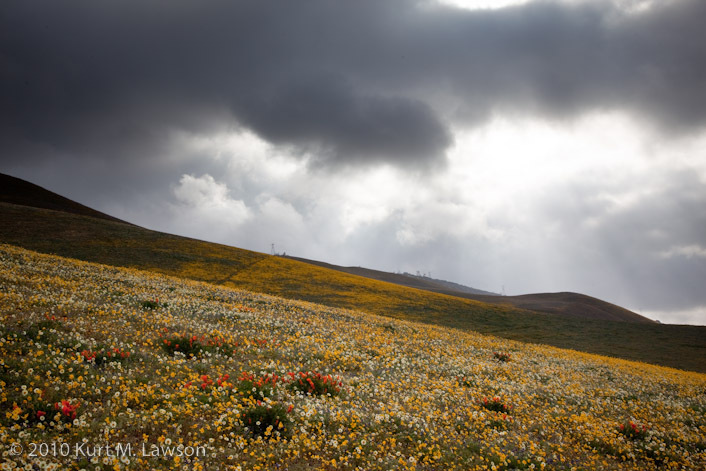 Up around 4000 feet, the wind was cold and blowing hard, but the flowers were open and the sun was dancing with the crazy fast moving clouds (See the video I at the end of this post). It was as if time was going fast forward for the clouds. At first when we arrived the clouds were hiding the sun completely and we weren’t sure what we were going to get. We drove around for a bit before deciding on an area to shoot and then waited for the light. I got out of the truck to get set up and then this beam of light shot out from the clouds like a spotlight or a UFO shining its beam down. In a panic I fired off a few shots and as luck would have it, I caught it. What looked like patches of yellow and gold painted onto the hillsides were revealed to be clumps of surprisingly diverse flowers up close. The flowers were yellow and white mostly with clumps of California Poppies and purple flowers as well. In some places the purple flowers were entire patches themselves. Which one of these two images from the same spot do you prefer? The flowers were really stunning, the hills rolling and the light dancing. At one point we looked over and some horses came up over the hill and for a brief moment were playing with each other. It was really quite a sight. You could almost imagine that the horses were wild. When we started are trek, we began with a spot where Robert had shot his awesome picture of 78 snowy white egrets hanging out at this little lake. When we arrived there were three of them and the light was dull as the sun was not yet escaping from behind the clouds’ veil. However when we went back later in the morning, the light was rapidly changing and the wind was blowing quite hard here. Sunlight was racing through the landscape in sections (as can be seen in the video at the end of this post). Studying the scene I realized that a wonderful opportunity was presented by the light. At certain times the foreground trees would light up in a blaze of direct sunlight while the hills immediately beyond were dark in the cloud shadow still. I waited and fired of more than 100 frames trying to capture what I had in mind with the fast changing light. In the end the third try was the winner and produced the image above. I envisioned it as black and white from the start, and it is really one of my all time favorite pictures I have ever had the pleasure of capturing. When we arrived in the morning there did turn out to be three egrets at the lake. It was quite dark and they would later fly off. Here by the side of the road was a nice little colony of poppies. It’s hardly surprising to see poppies around here as we were not far from the Antelope Valley Poppy Preserve. Another photographer who we encountered described the poppies as being “retina-searing orange” at the preserve, a phrase that has proven memorable. All in all it was an amazing morning and I walked away with a lot of amazing images. 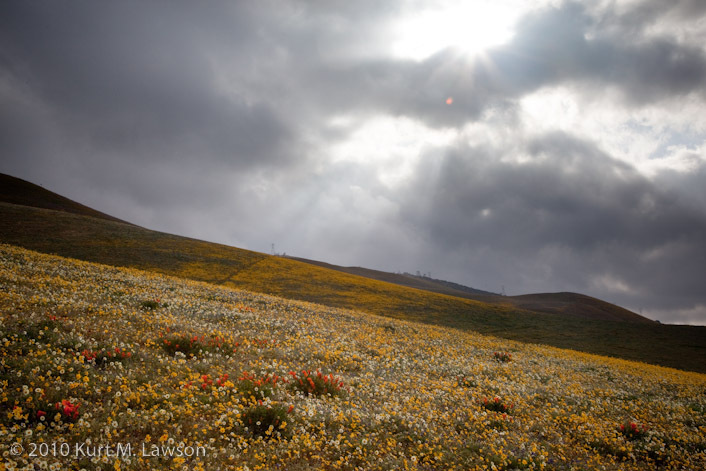 Next year I hope to tackle wildflower season with trips to Anza Borrego State Park, Anacapa Island, the Poppy Preserve and other places, though it might not be as wet a year as 2010 has been. Check out this video shot with my 5DII of the crazy changing light we experienced.